Final day, and I have to say it has been a tough week. Tough and rewarding, actually. What started as a huge ‘mess’ of solution, problems, and frustrations was concluded with five project presentations. 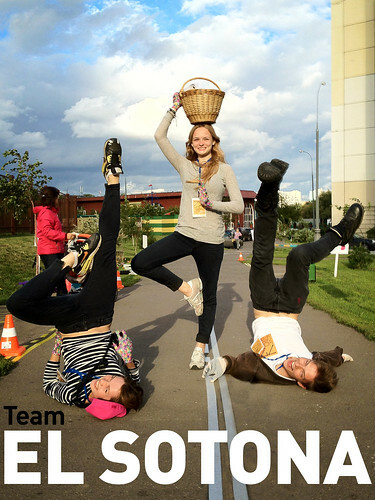 The ideas ranged from a bulletin board to cafés and festivals, and although the solutions were diverse in nature, they all were geared towards making the lives of people living in Yuzhnoportovy better. In the end, what were the learning outcomes of this workshop? In the beginning we – the workshop facilitators – gave a value proposition to the participants: by the end of this workshop you would know how to 1) identify problems (cartography + ethnography), 2) propose solutions to problems (business canvas), and 3) sell your solutions to relevant stakeholders (brand + business canvas + cartography). So, not only did the participants come up with solutions to actual problems, but they also learned how to apply these methods to other aspects of life, too! After the day off, it was time to focus on crafting a story to support the solution. As we see it, proposing a solution to a problem is only one part of the issue at hand: what is also needed is a story – or a brand – to connect with the people affected by the solution. With this assumption in mind, the participants started with word association tasks: how does our solution feel, what does it look like, what do we want to communicate with it? Shifting away from the actual, even concrete, project by focusing on the branding aspect, the participants were able to let their imagination run wild as various kinds of word associations started to emerge! Since our workshop lasts for a total of seven days, it is more than necessary to have a day off somewhere in the middle. This serves two purposes: first, it gives the participants time to reflect on what they have gone through so far, and second, it also makes it possible to gain distance to the tasks at hand. Thus, what we did was that we asked the participants to test their ideas during Day 5 with friends and strangers. Gaining feedback already during the process helps to steer the solutions away from the worst pitfalls. Or in other words, stepping back from the solution and talking to outsiders helps us in seeing the blind spots better. When it comes to solving systemic or individual problems, formulating how and why to start is more often than not one of the biggest challenges. To counter this, we utilized the Business Model Canvas (BMC) as a tool to reorganize and sharpen our thoughts. Despite its shortcomings, the BMC works relatively well as an idea generator. Not only does it clarify your current solution, but it can also give rise to completely new – sometimes even innovative – solutions! To identify societal – or systemic – problems, we believe cartography and ethnographic to be some of the most effective and enlightening methods. Bearing this in mind, we sent the students to the district today to gather data about people, interaction, places, and so forth. 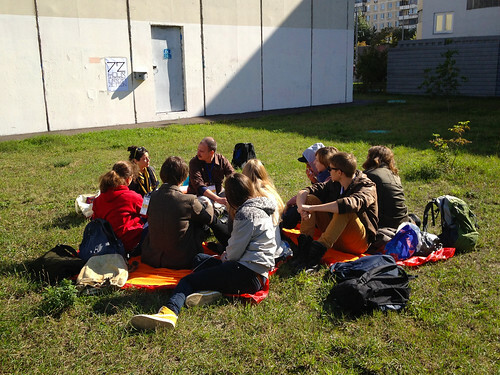 After a half-day ethnographic exercise in Yuzhnoportovy, the participants returned to Strelka with numerous problems and challenges identified there. Main focus was on people, spaces, and technologies, and interactions between these. As a result, the participants made their first map of Yuzhnoportovy with problems mapped on it. How do you transform cities through the combination of design, business, and technology? Furthermore, how does mapping of people, spaces, and technology help us in seeing our cities and their problems in a different light? These questions serve as a starting point for our workshop, in which our aim is to identify problems through ethnographic methods and cartography, and to offer solutions that are based on business-driven tools. To keep matters simple and effective, we have divided the workshop into three interconnected themes: mapping, modeling, and implementation. Each module lasts two days, and they will teach the participants different tools and methods on transforming cities through business, design, and technology. 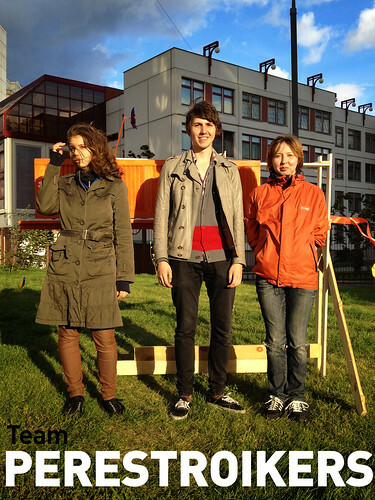 Just back from Moscow where we hosted a workshop at Strelka Institute over the last week. Together with 15 students from all kinds of professional backgrounds (just as we like it, from financial advisors and sociologists all the way to architects) we explored the district of Otradnoe in the north of Moscow — starting with a derive and ending with a grand finale where the students’ proposals around community building and strategies to facilitate communication and exchange were shared with the people of Otradnoe. The group of people dressed up in red raincoats and A-Boards must have been a novel sight for a Thursday evening, and it was great to watch the level of engagement and interest from the audience. Now, how can we sustain the momentum and maybe take some of the ideas further? В расписании неспокойное last minute editing. День напряженный. Надо все успеть а времени мало. Тьюторы сказали, что лучше прийти раньше, чтобы было больше времени на редактирование материала. Вместо 9 часов утра многие пришли к 11. Студия 2 на целый день превратилась в некую editing room, где каждая группа работала на своим фильмом. Почти для всех это был первый опыт редактирования фильма и создания фильма вообще с наложением музыкального сопровождения и т.п. Познание через практику. Методом проб и ошибок находятся нужные варианты. Многое не получается, но видео НУЖНО сделать. Пусть оно будет неполным, но БУДЕТ. Таковы правила. За такой настрой хочется сказать отдельное спасибо нашим тьюторам, Гилли и Керему, за то, что поддерживали нас в тот день, помогали решать появлявшиеся проблемы с воспроизведением. Знаете, когда до начала показа фильмов остается час, все остальные уже практически закончили, а у тебя еще не готово видео, программа ужасно тормозит и, кажется, ничего уже не получится, когда работаешь уже “через себя”, понимая что это будет результат ТВОЕЙ работы, – тогда появляются дополнительные силы закончить. Тогда нужен тот, кто скажет, что все будет хорошо. День креатива. Наступило время воплощения проектов в жизнь и оживления района Печатники. Некоторые ребята заезжали на Стрелку за инструментами, поэтому опоздали. Но работа уже вовcю кипела. Ставили, клеили, резали, красили, гремели. Была своеобразная большая мастерская на пленэре Людям все время было интересно, что же здесь происхолит, задавали много вопросов. И самым распространенным вопросом был: “Это рекламная акция?” У нас было не так много времени, чтобы все сделать, потому что помимо самого проекта нужно было придумать способ привлечь людей. Но всё было сделано. И все находили время для веселья. Ведь работа должна приносит удовольствие (it’s work, but it can also be fun)! играли в крестики-нолики в необычном варианте этой игры, представленной командой WHERE’S RODI? Этот день обещал был насыщенным, потому что в расписании стояло планирование проектов-интервенций, обсуждение всевозможных вариантов и средств для их достижения. Вечером мы опять приехали в Печатники, чтобы оставить материалы (а некоторые уже решили начать делать свой проект). Но произошла небольшая загвоздка с отсутствием места для хранения, которая в скором времени разрешилась. Одна жительница района, молодая девушка, у которой ребята брали интервью и которая заинтересовалась нашей деятельностью, предложила оставить все у себя дома на балконе. Было очень мило и трогательно с ее стороны.